Ashworth Ave N from Echo Lake Park, February 4, 2019. 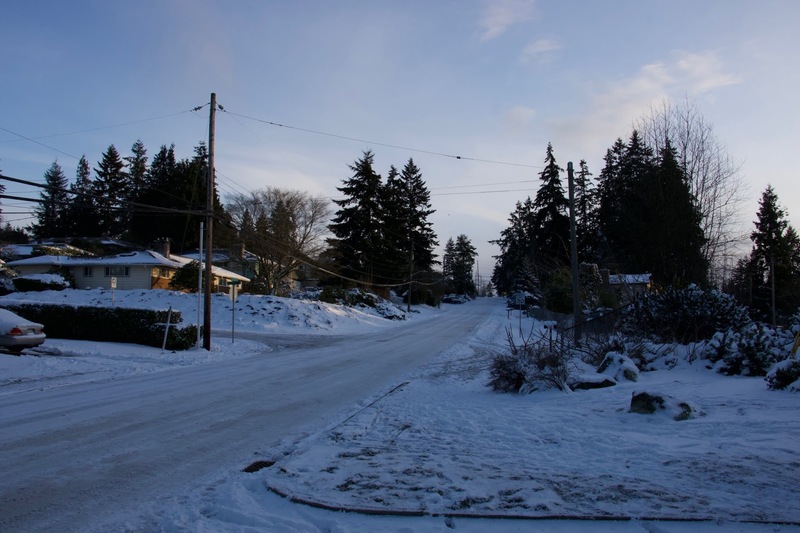 The National Weather Service in Seattle has issued a winter storm warning in effect starting Friday at 12pm and ending Saturday at 12pm. In general 3-6 inches of snow is expected from this storm, but amounts can vary widely, with up to a foot of snow possible in some locations. North winds are expected to pick up as well with wind speeds of 15-25mph and gusts to 35mph. Temperatures during the day will probably drop to the mid 20's or are expected to remain in the mid-upper 20's through the evening and overnight. Power outages are possible, but probably not going to be as widespread as with Monday's storm. This weather system is what is considered a near perfect snow-maker for the Pacific Northwest. The latest high resolution models I've reviewed seem to consistently paint an 8-10" accumulation over Shoreline and Lake Forest Park specifically, although it varies slightly from model to model on where that narrow band hits. The forecast still keeps a chance of snow, and a few more snow events, on the radar for the rest of the weekend and next week. Still, no sign of warming up for the extended forecast. I suspect this cold snap is going to be historic when everything is done.